Coconut palm sugar, or palm blossom sugar, is gradually being discovered in western markets as a natural sweetener with some surprising benefits for companies and consumers. The product has a distinct taste and rich flavour, unlike any other natural sweetener. Compared to natural cane sugar, the sweetness is somewhat less pronounced and the flavour is more flowery. The taste sensation is of course best experienced personally. 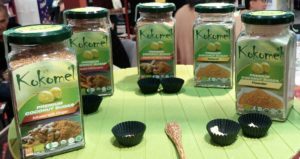 At Biofach 2017, CBI is presenting in its pavilion four companies producing this emerging product: Aliet Green and Profil Mitra Abadi from Indonesia; Treelife Organic and Lao Integrated Organic Farms from the Philippines. The product is available in granulated and liquid form (syrup) and also flavoured, with turmeric, ginger and other spices. Next to the distinct flavour profile, the product has important health and nutrition benefits. Unlike the empty calories present in white table sugar, palm sugar contains important minerals and vitamins such as copper, iron, magnesium, zinc and potassium and vitamins C and B1 (thiamine). Do note that a healthy diet will contribute much more to the intake of these nutrients, especially with average consumption levels of coconut sugar. Surprisingly for a sugar product, coconut sugar has a low glycemic index, although the few existing measurements vary from 35 to 54 depending on the source. Below 55 a product is considered low glycemic, which means that the glucose level of the blood rises more gradually after eating. A possible explanation for this characteristic is the presence of inulin, which would slow down the uptake of glucose in the blood. Again a word of caution: sugar will often be used in a composite product, so the overall glycemic index of that product will be different. Still, it is a valuable characteristic. Palm sugar has a long tradition of use of several millennia. Today it is widely used in Thai, Filipino and Indonesian cooking. As a sweetener it can be used in coffee, tea, desserts, cookies, cake and in hot dishes. Industrial uses are similar to those of natural cane sugar, for example pastry and bakery products, breakfast cereals, beverages and desserts. Exporters are becoming more versatile in adapting the product to customer specifications, regarding colour, size of the granules and the sweetness of the syrup. All companies have strict quality and food safety management systems, such as HACCP and FSSC 22000. You can meet the exporters from 15-18 February at Biofach in Hall 4, stand 471 and 571. Reference: Dalibard, Christophe. “Overall view on the tradition of tapping palm trees and prospects for animal production.” Livestock Research for Rural Development 11.1 (1999): 1-37. This article will also be posted on media managed by CBI.